A quick review, for those who haven’t been following this series of posts. For decades, famished golfers have stopped at a small, nondescript shack between the 9th and 10th holes at Olympic to devour what quite possibly could be the greatest burger known to mankind. It not only tastes great, but it looks funny, too. You see, back in 1950, a guy named Bill Parrish opened a small burger stand outside the boundaries of Olympic, but close enough for golfers to run over and buy a burger or dog between holes. 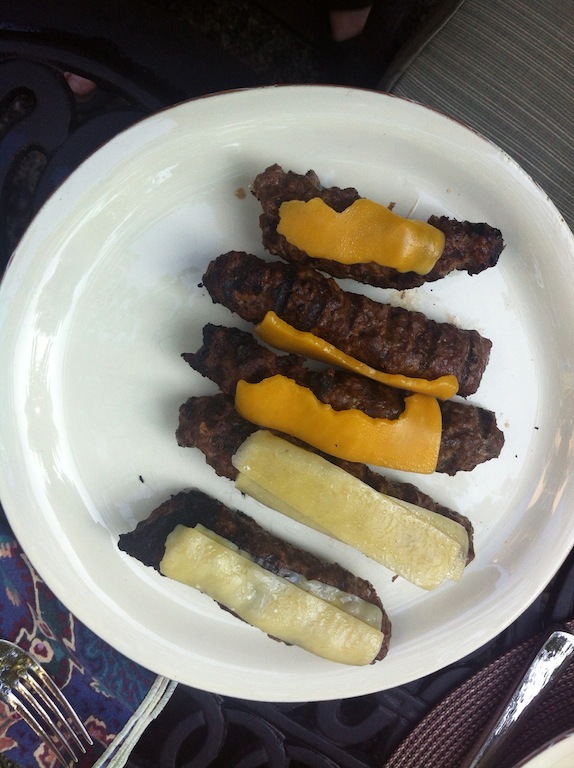 To save money, Bill decided to cut his burgers in half and serve them on hot dog rolls. That way he didn’t have to waste money on buying two kinds of buns. The result is legendary. You can hold it one hand and wolf it down in no time. And did I mention it tastes fabulous? If you’ve ever played the famous Lake Course, you know what I’m talking about. I then explained that Bill’s daughter now makes the burgers, using a mold to shape the ground beef and concluding that we need one of those molds. This morning, my pal Russ was kind enough to send me a link to the Kitchen Art Ham Dogger, available from Amazon for just $6.29. … I ordered one. It arrives tomorrow. Ham dogs this weekend. Hot dog! No ham dogs that weekend, as it turns out. Alternative eating options arose. And then Gail went away for a few days. But patience is a virtue, and I’m virtuous, so I waited. Last night I got my reward. Ham dogs! Or, Bill burgers! When I got home, Gail had already molded them into shape. 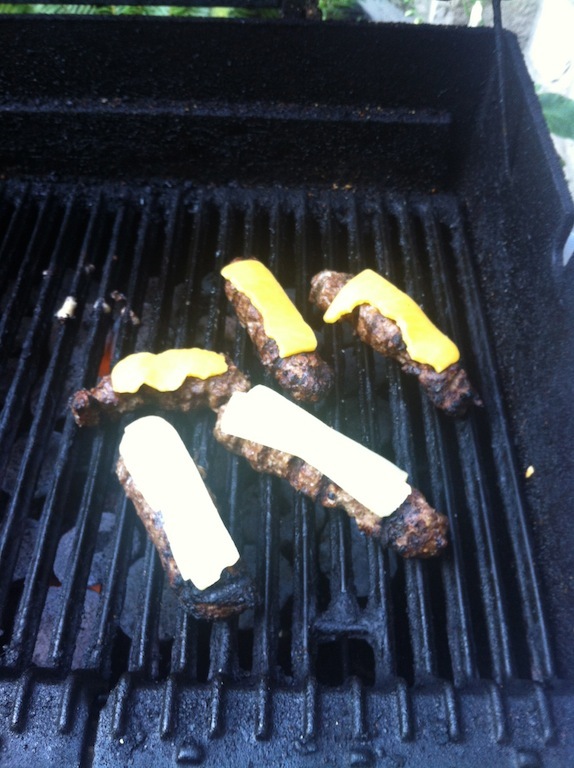 Soon she had them on the grill, and when I took over, all I had to do is roll them. I suppose that was a first, rolling rather than flipping the burgers. It turns out that putting cheese on a ham dog isn’t so easy. Something to do with dogs being curved, unlike burgers. If you slice the cheese flat, you will discover a problem. The problem may look minor in the picture below. The cheese melts and curves after all. But it doesn’t adhere as tightly as flat cheese does on a flat burger. Maybe you can see that better in the next picture. Take a close look at the second ham dog from the top. 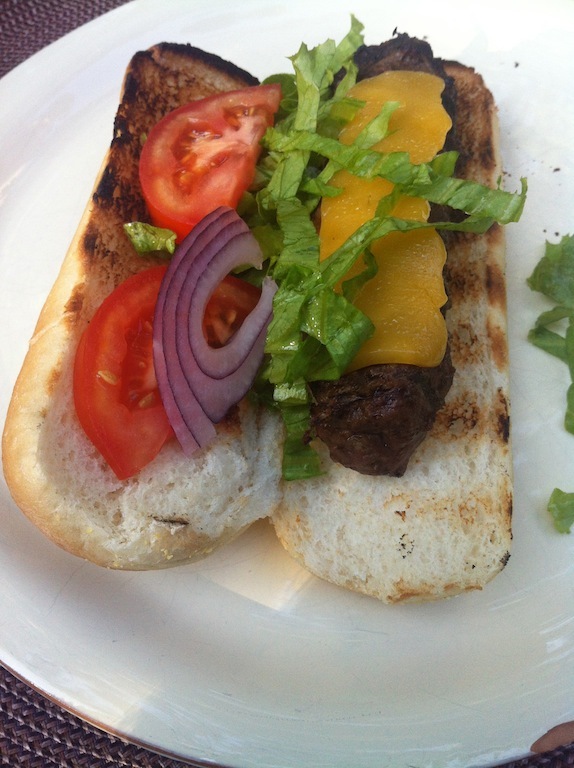 Another problem: the fixings don’t see to rest inside the bun as well as in a burger bun. (See photo at top.) But maybe we didn’t buy the right hot dog buns. We need to experiment a little more. No matter. They tasted good. Which prompts the fundamental question. Why bother? Sure, they tasted good, but no better than if we shaped them like burgers and ate them on burger buns. Is there a point to this enterprise, other than to use the Kitchen Art Ham Dogger that we now have $6.29 (plus tax) invested in? Yes, there is a point, as Gail reminded me, and it was Bill Parrish’s point as well, his source of inspiration. If you’re making both hamburgers and hot dogs, turning your hamburgers into Bill Burgers allows you to lay out one type of bun only. It simplifies shopping, minimizes waste, saves money. Kind of like growing melons shaped like cubes. The melons can travel in the same boxes used for other goods, saving space and money. Now we must search for the perfect Bill Burger bun. And a melon mold. Had my first ever Bill Burger in the members tent, back in June, while at the Olympic Club for the U.S. Open. Awesome history, story, and a good burger! I’d love to try one. And I would have loved to be there.